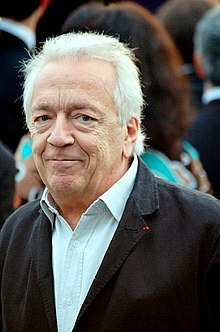 Jean-Pierre Cassel at the 2006 Cannes Film Festival. Cassel was born Jean-Pierre Crochon in Paris, the son of Louise-Marguerite (née Fabrègue), an opera singer, and Georges Crochon, a doctor. Cassel was discovered by Gene Kelly as he tap danced on stage, and later cast in the 1957 film The Happy Road. Then Cassel gained prominence in the late 1950s as a hero in comedies by Philippe de Broca such as Male Companion and through his role as 'Jean François Jardie' in the famous French resistance piece L' Armée des ombres . During the 1960s and 1970s he worked with Claude Chabrol (The Breach), Luis Buñuel (as Stéphane Audran's husband in The Discreet Charm of the Bourgeoisie 1972), Ken Annakin (as Frenchman in Those Magnificent Men in their Flying Machines 1965), Gérard Brach (as Claude Jade's lover in The Boat on the Grass), Richard Lester (as Louis XIII of France in The Three Musketeers 1973 and its sequel The Four Musketeers 1974), Sidney Lumet (as Pierre in Murder on the Orient Express), Joseph Losey (with Isabelle Huppert in The Trout). He also made a memorable appearance in Oh! What a Lovely War as a French military officer singing 'Belgium put the Kibosh on the Kaiser'. In later years he appeared in Robert Altman's Prêt-à-Porter (1994) and also as Dr. Paul Gachet for Vincent & Theo (1990). In 2006, at the age of 74, he climbed back on stage for a retrospective of Serge Gainsbourg Jean-Pierre Cassel chante et danse Gainsbourg Suite. This homage to an old friend (he knew Gainsbourg in the 1950s) featured various songs of the famous French composer among which three unpublished songs named "Top à Cassel" – "Cliquediclac", "Ouh ! Là là là là", and "Viva la pizza" – all of which were intended for a television show aired in 1964. In 2007, Cassel appeared in dual roles (as Père Lucien and the Lourdes souvenir vendor) in Julian Schnabel's film The Diving Bell and the Butterfly. He's the father of Vincent Cassel, Mathias Cassel (also known as Rockin' Squat, leader of the French rap crew Assassin) and Cécile Cassel. This page was last edited on 15 March 2019, at 03:13 (UTC).